Some of the APC supporters at INEC's main gate in Port Harcourt on Thursday. 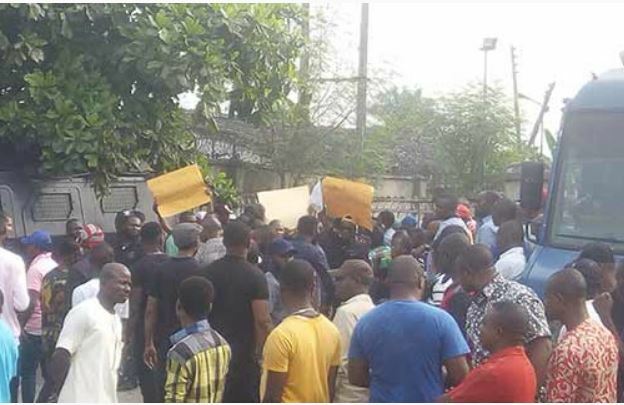 SCORES of supporters of the All Progressives Congress, APC, in Rivers State have taken over the main gate of the Independent National Electoral Commission in Port Harcourt in protest of the non-inclusion of their candidates in the ballot for Saturdays and March 2, 2019 elections. The protesters threatened that election would not hold in Rivers if INEC refused to allow their candidates to be part of the exercise.